Today was about meeting deadlines, about my internet connection freezing as I attempted to save the full page of text I had just written (I’m normally so “save”-happy, I don’t know what happened today). It was about having to start over, trying to recapture the words that seemed to flow freely before I lost everything. It was about being on hold with the DMV for over an hour while I did other work. At the 1:07 mark the hold music stopped. I picked up the receiver expecting an agent to be on the line. Not quite. The line was dead. Mondays, oh, well. I know there are much worse things to complain about. Still, I couldn’t be happier about leaving the workday behind. But having a tall glass of caffeine-loaded iced tea in the middle of the afternoon kept me amped and restless. I thought I might catch up on other work at home but my brain decided to clock out as soon as I put my bags down by the front door. Instead I turned on the oven, mashed the overripe bananas that have been sitting on the counter and I made this bread. This is yet another variation on my favorite banana bread recipe but this time I made even more changes. I removed the eggs and dairy, replacing them with applesauce and coconut oil. I replaced some of the nuts with flaxseeds, I reduced the sugar to make room for the sweetened shredded coconut and I went heavy on the bananas. The verdict? I haven’t yet met a banana bread I didn’t like but this just might give my favorite a run for its money. With a crisp, golden exterior, a soft interior and the occasional crunch from the flaxseeds, this bread didn’t suffer at all from the substitutions I made. Even my usually coconut-averse husband had two thick slices before bedtime. As for me, I savored one of these slices after taking these pictures and somehow the day’s troubles just melted away. I can hardly wait for Tuesday morning to come so I can enjoy a slice (or two) with my morning tea. 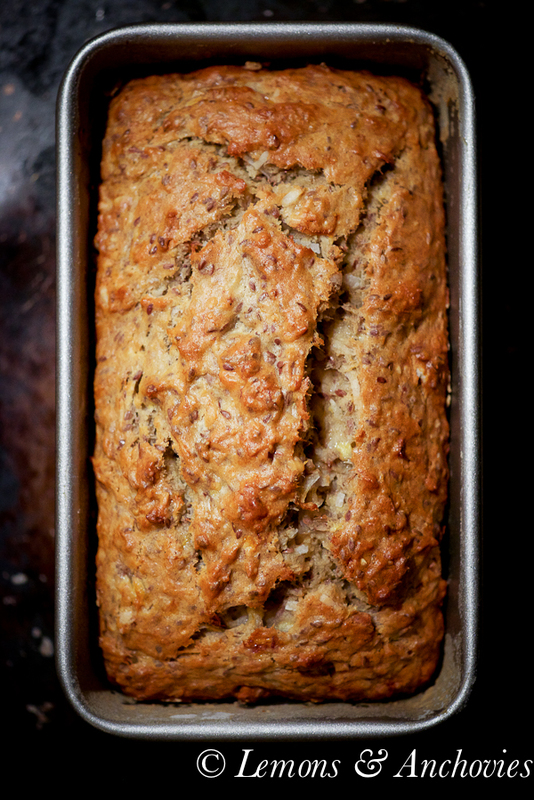 My favorite banana bread got a makeover--I replaced the eggs and dairy with coconut oil and applesauce and added crunch with flaxseeds. If I didn't make this myself I wouldn't be able to tell the difference. Preheat oven to 350º F. Grease a 9 x 5 inch loaf pan and dust with flour, tapping out the excess. Toast the walnuts over medium-low heat in a skillet for a few minutes or until fragrant. Set aside. Whisk all the dry ingredients together (including the coconut, walnuts and flaxseeds) in a large bowl and set aside. Mix the mashed bananas, coconut oil, applesauce and rum with a wooden spoon in another bowl. Lightly fold the wet mixture into the dry mixture with a rubber spatula until just combined and the batter looks thick and chunky. Transfer batter into the greased and dusted loaf pan. Bake until the loaf is golden brown and a toothpick inserted in the center comes out clean, about 55 minutes. Cool in the pan for five minutes then transfer to a wire rack. Serve warm or at room temperature. Oh this looks so delicious!!! I love banana bread and I can’t wait to try this version!!! I made this over the weekend and included a little bit of lemon zest. Amazing!! I highly recommend. That looks like some seriously delicious banana bread! This is a beautiful banana bread if I ever saw one! 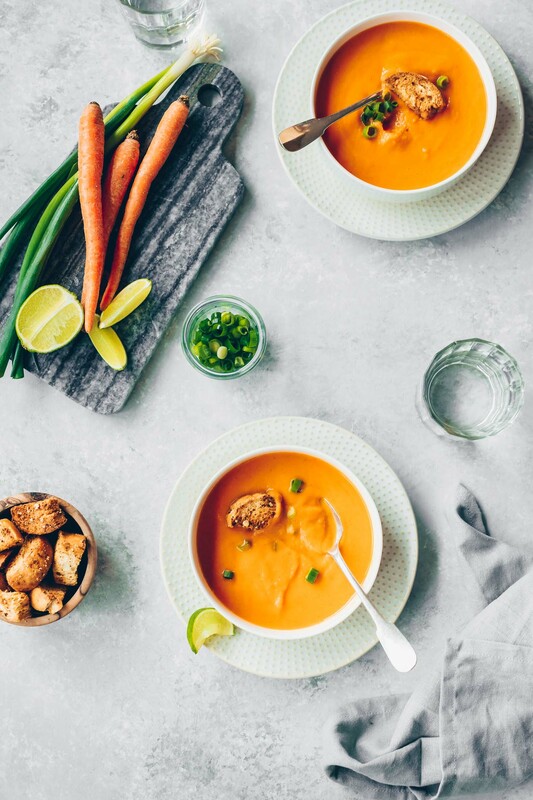 I love your adaptations – so healthy and delicious sounding! What a beautifully golden loaf! This would make a delicious breakfast :). Oh wow! I love banana bread and then add coconut to it?? Delicious! Hope you’re having a better day, Jean. Thanks, Cristina! Today is definitely much better. I called the DMV first thing and I got a call back in less than 10 minutes! a healthy loaf of banana bread. All I need is a slice of this and a giant mug of coffee and I am one happy lady! Your day sounds like my year. You made an excellent come back with this bread. I had to restock my coconut oil because I used it all, but now I have to get flaxseeds. It’s never ending isn’t it. I hope I can get in a little baking later, I still have to get some work done and then get ready for my class tomorrow. When is it Saturday? Hope the rest of your week is a breeze. This is absolutely lovely, Jean! I want to go put a loaf in the oven right now. Hope the rest of the week went well for you…thank God tomorrows Friday! 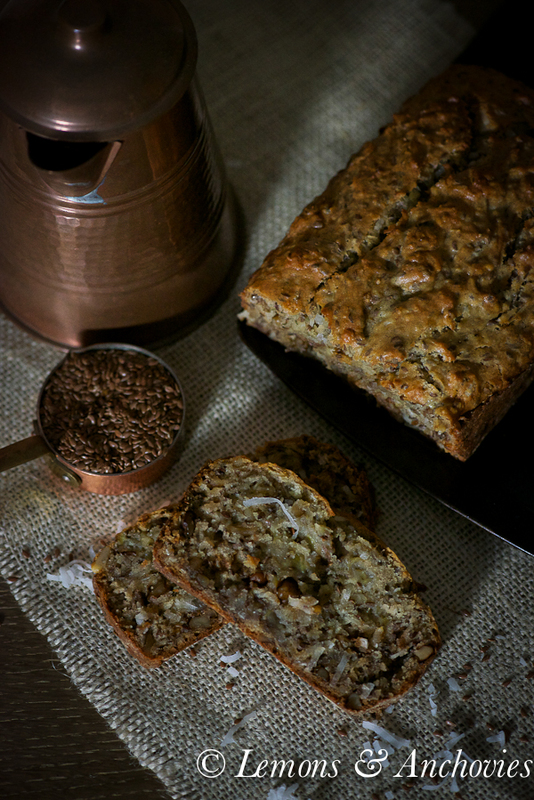 This banana bread would go so, so well with the cup of coffee that I am having right now. That texture is just perfect, and the flavor combo is amazing!! This banana bread sounds amazing Jean! I LOVE the addition of flaxseed, what a great idea! We rarely have brown bananas around here, i think I’ll have to buy some more and hide a few, just so I can make a banana bread, haven’t made one in ages! 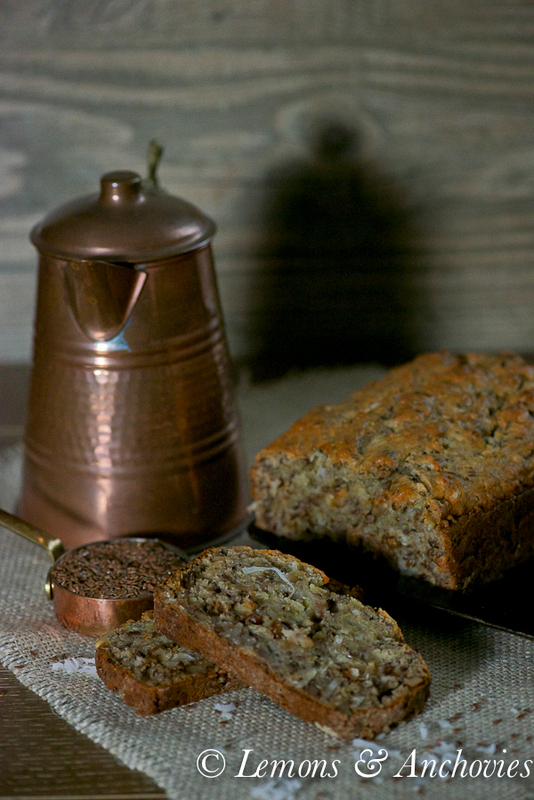 Banana bread is so wonderful and making it healthier is even better. Ahhh… the DMV. My son just got his driver’s license and didn’t know what I meant when I told him how I dreaded the DMV. “How can it be that bad” he said as we made our way to take his permit test. Well, we got there at the appointed time (we properly made an appointment exactly on his 15 1/2 date) and the DMV lady said, “Sorry, our computers are down you will have to come back another day.” Unfortunately we couldn’t get another appointment for three weeks and with waits over 3 hours long we didn’t want to just “wing it”. He learned…. Love what you’ve done with the banana bread! Flax is a favorite of mine, but I’ve not been utilizing my coconut oil as I should be. Thanks for this one! It’s perfect for Liv and the girls after school. Jean – sorry your Monday started off so dreadful, but the rest of day was a bit brighter. Especially while enjoying this divine bread. My mouth is watering and just wish I had a slice or two right now. Happy Saturday!! I’ve been looking for ways to spruce up the old banana bread recipe. This is perfect!! And I love coconut, so what could be better? FANTASTIC – baked this a couple of days ago and the family went wild. Thanks so much for adding a twist to the normal banana bread recipe. Will be back for more! Thanks again. I always tweak my banana breads. 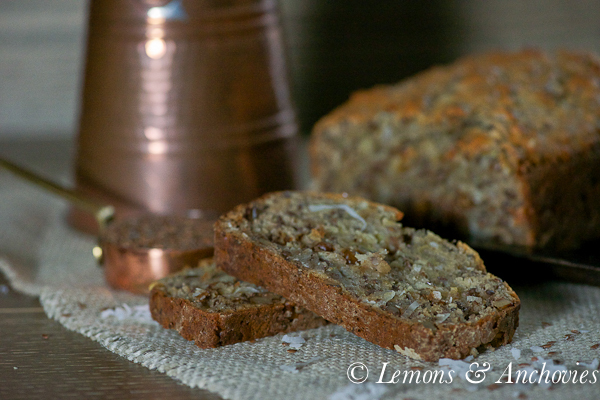 I love to add coconut in so many things and banana bread is a winner! I can’t wait to try your version with the flax seed. Love your romantic lighting. So pretty, Jean! Sounds so yummy! Going to try this today! 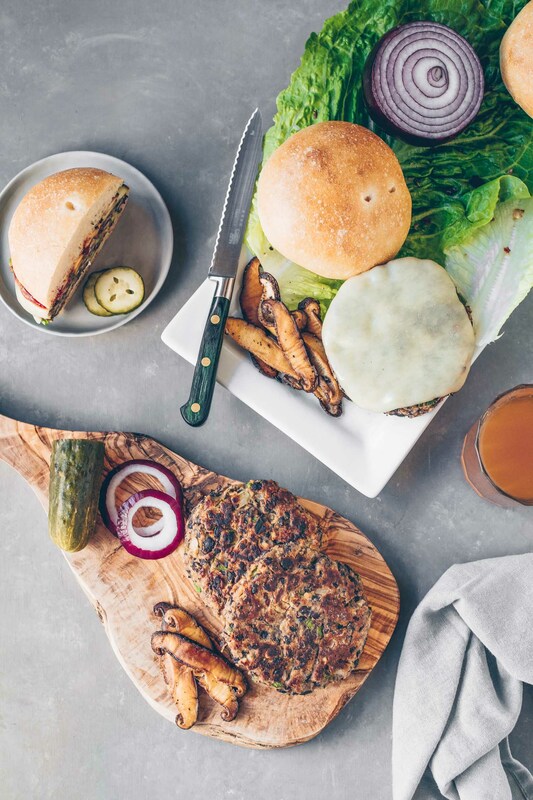 Is it ok to just use ground flaxseed? Amanda, thanks so much for the feedback; I’m so glad the recipe worked for you. Great to know that chia seeds will work, too. Did you use the same amount listed for the flaxseed above? Thanks again for trying my recipe! Hi Jean, Happy Saturday. Just wanted to let you know how good this bread was, I made it the other day. Also on your site the top social media buttons and ones on the bottom of the page have ? marks in them also on your recipe page there is a 404 error. Could be my browser safari, but not sure. Enjoy the rest of your weekend.